—remaining part is already known to you. 31 December 2014: Final result after interview declared. Click me for Marksheets- for both passed and failed candidates. Click me to download Interview call letters. Click me for see roll number of successful candidates in written exam, and the new application form for them. I don’t know if following cutoffs are only for Chandigarh or all India. Because so far I saw only one marksheet of a friend who had atpplied for Chandigarh posting. For all those cleared RBI Assistants Exam. Congrats. Has any one found out highest marks scored by candidates from Chennai. As regards Mr Raja’s query….don’t worry. you may obtain NOC from your employer even now and you may have to submit the NOC at the time of interview. Take care. Incidentally, what is your score? can anyone tell me what are the career prospects for an rbi assistant. after how many years one can be eligible to write dept exam for officer post? what was highest cut-off who interviewed in chandigarh from general category. 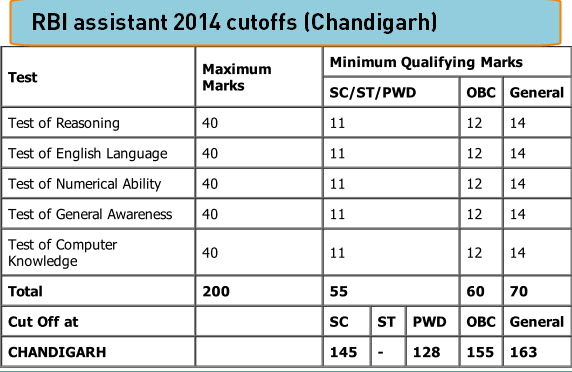 what was highest cut-off who interviewed in chandigarh for ASSISTANT 2014 from general category. What is th procedure now? As in what else we have to submit?????? Now that we r provisionally selected? Any one sharing his/her experience will be welcome… happy new year to all..have a blast..
You can find the list but the last date for checking marks is over.. I attended interview in Bangalore, but I could not make in final list. No regrets as I was working in Canara Bank. To recollect Interview. Interview panel consists 4 members including 1 lady member. Panel members very coordial & it went on well. 1. Please very careful while filling application form, most of the questions surrounding ur application form. 2.One thing which I noticed as I gave IBPS PO interview also here level of Interview is tough which covers ur state current affairs as well Banking awareness. 3. One member deliberately asking in mother tounge I.e Kannada just to know candidate is fluent in mother toungue as posts are state based. 4 . My interview started with my native place and wht our parents doing. Importance of native place. 5. They asked role of RBI how it different from nationalised bank so prepare well with RBI. 7. One more thing, whenever I gave wrong answer they behave like correct one and dig further then they trap me this is not right answer. 8. Be calm and do not take stress. Just be yourself. For me interview duration was 30 mins. Sir i had given Rbi assistant and i attempt 186 questions.Sir i want to improve my maths please let me know the way out and do i have to prepare for math somewhere in other city. i completed my M.E. whether i should put my pg qualification or only ug is enuf? while short listing in interview its necessary to say my pg qualification? or hiding that is better? plz reply…..
hi, thank you all for giving such pearls of wisdoms . my final year result is declared online but still marksheet is not yet get.am I eligible for RBI-assistant exam? kindly tell me sir how to prepare GA for rbi asstant.